Biao Wang and Mauricio Alvarez-Mesa and Chi Ching Chi and Ben Juurlink (2015). Parallel H.264/AVC Motion Compensation for GPUs Using OpenCL. IEEE Transactions on Circuits and Systems for Video Technology, 525-531. Biao Wang and Mauricio Alvarez-Mesa and Chi Ching Chi and Ben Juurlink (2013). An Optimized Parallel IDCT on Graphics Processing Units. Euro-Par 2012: Parallel Processing Workshops. Springer Berlin Heidelberg, 155-164. Biao Wang and Diego F. de Souza and Mauricio Alvarez-Mesa and Chi Ching Chi and Ben Juurlink and Aleksandar Ilic and Nuno Roma and Leonel Sousa (2017). GPU Parallelization of HEVC In-Loop Filters. International Journal of Parallel Programming, 1–21. Biao Wang and Diego F. de Souza and Mauricio Alvarez-Mesa and Chi Ching Chi and Ben Juurlink and Aleksandar Ilic and Nuno Roma and Leonel Sousa (2016). Efficient HEVC decoder for heterogeneous CPU with GPU systems. 2016 IEEE 18th International Workshop on Multimedia Signal Processing (MMSP), 1-6. Biao Wang received the M.S. degree in Computer Application Technology in July 2010 and Bachelor degree in Computer Software Technology in July 2007, both from University of Electronic Science and Technology of China (UESTC), ChengDu, China. Since Oct 2010, he joined the Embedded Systems Architecture as a PhD student with scholarship from China Scholarship Council (CSC). His research is focused on video decoding using Graphic Processing Units (GPUs). He is experienced in parallelization of H.264 and H.265 decoding kernels using OpenCL programming model. Some of these works are published in international conferences and prestigious journals. 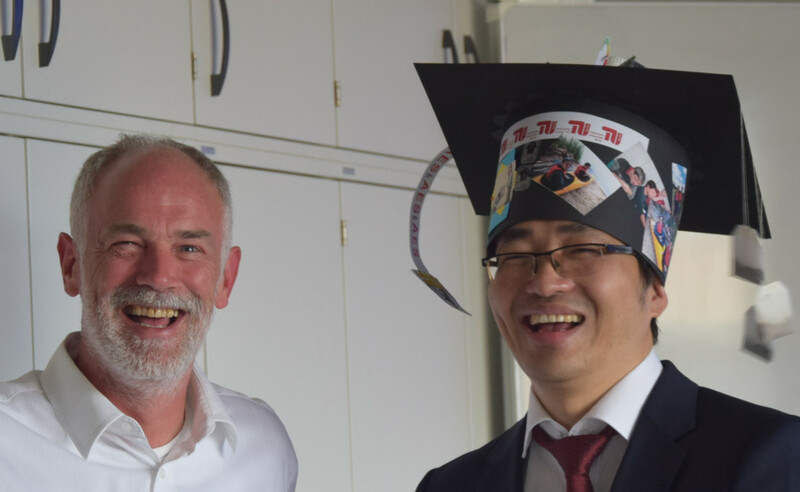 15.05.2018: Biao Wang successfully completed his PhD defense. M.Sc. Biao Wang successfully completed his PhD defense on Tuesday 15th May 2018. His thesis title was: "High-performance Video Decoding using Graphics Processing Units”. Congratulation Dr. Wang for your success and we wish you the best in your future!